Hundreds of Egyptians on Wednesday afternoon staged a protest march against sexual harassment and violence against women from Cairo’s Sayyida Zeinab Square to the nearby Tahrir Square. The rally brought together men and women of different backgrounds and ages, in addition to activists who held banners aloft bearing slogans against sexual harassment. "Silence is unacceptable; my anger will be heard," one banner read. "A safe square for all; Down with sexual harassment!" read another. Marchers also shouted chants against President Mohamed Morsi and the Muslim Brotherhood group from which he hails. The rally comes in response to recent cases of sexual assault in both Tahrir Square and Cairo’s Mohamed Mahmoud Street. Some anti-sexual harassment activists suspect that recent attacks – which occurred during political demonstrations – may have been planned in advance. Wednesday’s march was organised by several local political and feminist groups, including the OpAnti-Sexual Harassment and Baheya Ya Misr movements. A handful of political parties also participated, including the Egyptian Social Democratic Party and the Socialist Popular Alliance. While en route to Tahrir Square, volunteers from OpAnti-Sexual Harassment formed human shields around the marchers to protect them from possible harassment. 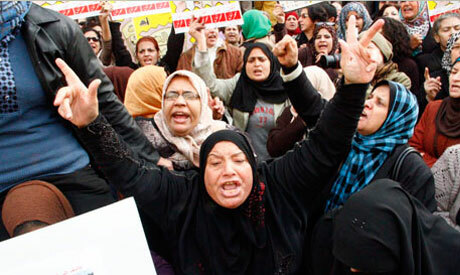 A number of other recent anti-harassment rallies held in Cairo were attacked by unidentified assailants.